How to watch The Hunchback of Notre Dame II (2002) on Netflix Portugal! Sorry, The Hunchback of Notre Dame II is not available on Portuguese Netflix, but you can unlock it right now in Portugal and start watching! With a few simple steps you can change your Netflix region to a country like Egypt and start watching Egyptian Netflix, which includes The Hunchback of Notre Dame II. We'll keep checking Netflix Portugal for The Hunchback of Notre Dame II, and this page will be updated with any changes. 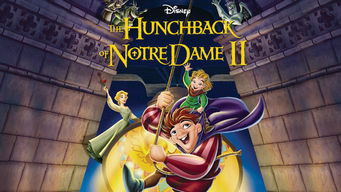 The Hunchback of Notre Dame II is not available in Portugal BUT it can be unlocked and viewed! In this charming sequel to the original animated classic, Quasi falls in love with Madellaine, the enchanting assistant to a sinister magician. Disney’s bell-ringer returns, but when Quasimodo falls in love, things might not go too smoothly ... call it a hunch. There is a way to watch The Hunchback of Notre Dame II in Portugal, even though it isn't currently available on Netflix locally. What you need is a system that lets you change your Netflix country. With a few simple steps you can be watching The Hunchback of Notre Dame II and thousands of other titles! Watch "The Hunchback of Notre Dame II"